Pencilled by Joe Madureira for Wizard: The Guide to Comics #111. Part of a feature titled "The Big 80s" which invited big name comic book artists to draw their favorite 80s cartoon characters. 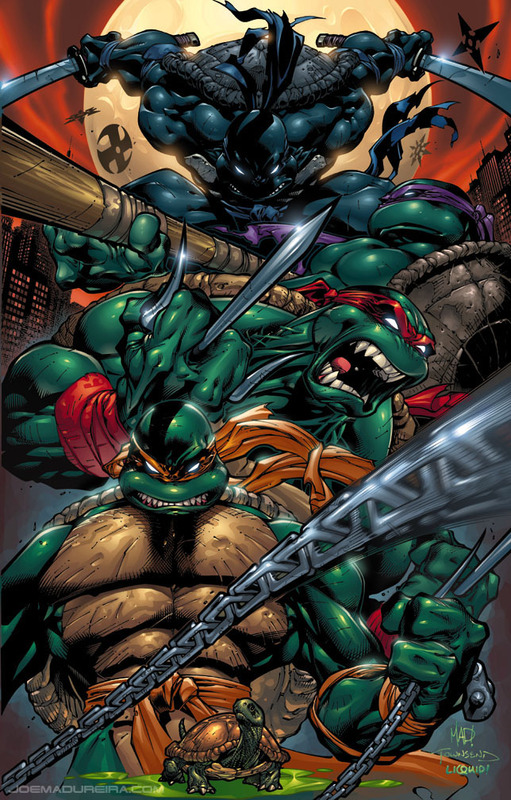 On the brightside, it gave us Joe Mad's pretty bitchin' interpretation of the Ninja Turtles! On the downside, it gave us Pat Lee's horrendous interpretation of the Transformers. I've seen this piece edited and recolored oodles of times across the internet by fans. It's nice to see the actual reference from which it originated. To my knowledge, this is one of the earliest portrayals of Michelangelo using a kusari-gama (or some kind of chain weapon with a weight on one end). I had this drawing in my mind when thinking about the visual inspiration for the "Good Smile Company" TMNT statues. Back when this thing was cycling around the internet without any attention to its original context, I saw many people claiming it as Todd MacFarlane's take on the TMNT.